SPIED: C27 Nissan Serena with Impul kit seen in M'sia! 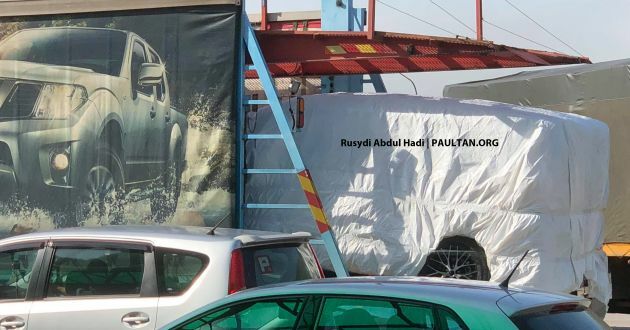 Home » Cars » SPIED: C27 Nissan Serena with Impul kit seen in M’sia! SPIED: C27 Nissan Serena with Impul kit seen in M’sia! In true Edaran Tan Chong Motor (ETCM) fashion, the C27 Nissan Serena S-Hybrid may soon be available with Impul kit, as seen in this photo courtesy of reader Rusydi Abdul Hadi. There’s little to give away the contents under the white canvas wrapping, but the boxy shape and very specific Impul Millennium rims were enough to convince us that it’s the Serena. Based on Impul’s website, there are ample retrofittable aftermarket parts, ranging from aggressive-looking body kit to exhaust system, suspension and a variety of cabin accessories, but there’s no way of knowing the extent of what we would be getting. What we do know is that the seven-seat MVP will ride on dual-tone 18-inch Impul Millennium alloys, shod with 215/45 tyres. Previously, in July 2016, ETCM introduced the C26 Serena S-Hybrid Tuned by Impul, one that came with a full exterior bodykit, 18-inch SX-50 alloys and diamond-stitched combination leather seats (exclusive to the Premium Highway Star). The new C27 version could very well be as simple as its predecessor’s aesthetic update, which would include a new front bumper, door panel kit, rear half spoiler and aero door visors. Other upgradable items include Impul’s Super Shock Type I suspension system with Impul sports coil springs (the latter lowers ride height by up to -30 mm! ), Impul Blast II Muffler exhaust system, Impul custom steering wheel stitching, LED front fog lamps, as well as Impul floor mat and Impul badging. However, don’t expect these to be offered here in Malaysia. No changes should be done to the engine – the MR20DD 2.0 litre direct-injected four-cylinder petrol engine makes 150 PS at 6,000 rpm and 200 Nm at 4,400 rpm, and is mated to an Xtronic CVT which drives the front wheels. The engine is assisted by a 2.6 PS/48 Nm ECO electric motor that replaces the starter motor, controls the Idling Stop System and energy regeneration. The motor also offers acceleration assistance to the MPV, providing a 50 Nm torque boost for up to one second when moving away from a standstill. The Serena S-Hybrid boasts a fuel efficiency rating of 14.2 kilometres per litre on the European NEDC cycle. So, thoughts? Worst Japanese-marque in Malaysia. Non-exiting model range compounded with outdated specs catering to uncles and aunties. Nice soon it will also be available for existing owners too. My wife’s front bumper just got whacked by a motorcycle in KL and this will be a good reason to change bodykits for the wife’s MPV lol. pro-pilot please not this impul or nismo kits.